In stock -This product will ship today if ordered within the next 14 hours and 16 minutes. 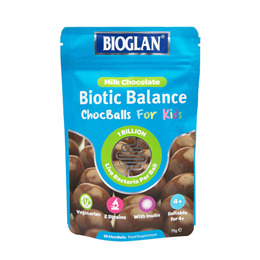 Bioglan Biotic Balance ChocBalls are a tasty way to include live bacteria in your diet every day. Each ChocBall contains 2 high quality live strains of bacteria plus a great source of fibre. Suitable for adults and children aged 4+. 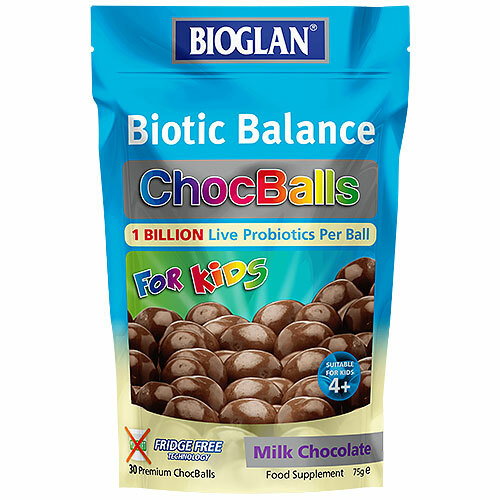 Made with real milk chocolate, Bioglan Biotic Balance ChocBalls deliciously roll together 1 billion live bacteria including proprietary cultures Lactobacillus Rosell and Bifodobacterium Rosell plus Inulin, all in one small, solid milk chocolate ball. Milk Chocolate (93.4%) [Sugar, Whole Milk Powder**, Cocoa Butter, Cocoa Mass, Emulsifiers: Soya Lecithin*, Flavouring: Natural Vanilla], Inulin (5%), Live Bacterial Cultures (1.6%) (Lactobacillus Rosell, Bifdobacterium Rosell), Glazing Agent (Acacia). Take 1-2 ChocBalls daily, Suitable for Children aged 4+. There is no need to keep this product in the fridge. Not to be swallowed whole, do not exceed 4 ChocBalls per day. Below are reviews of Bioglan Biotic Balance ChocBalls - Milk - 30 ChocBalls by bodykind customers. If you have tried this product we'd love to hear what you think so please leave a review.